Robots entering the manufacturing assembly line has hit many industries as a perfect storm. A recent study by McKinsey found that one-third of the U.S. workforce will be impacted by automation by 2030, with many employees losing their jobs. At the same time, automation and robotics are increasingly helping U.S. manufacturers bring production back home from low wage countries such as China. According to the U.S. based Reshoring Initiative (RI), even though automation will continue to eliminate some low and mid-skill jobs, it decreases costs and restores competitive advantage of U.S. businesses, making reshoring an attractive option to outsourcing. Robotics assembly lines may not create as many jobs as traditional industrial manufacturing businesses. But, by using automated manufacturing, the factories and their output are located close to customers and controlled directly by company management. And while at the robotic assembly line there are not many people, the local factory will need local community support, local subcontractors, component vendors, warehouse workers, and other local service professionals – which all means additional job opportunities that were not there when the factory was located overseas. The most common driver for the current reshoring trend is the rising cost of labor in China, where wages for manufacturing jobs tripled between 2005 and 2016 (by Euromonitor) and are reaching $6.5 per hour by 2020 (Statista). The average hourly cost of a manufacturing worker to an employer is $36 in the United States, while the hourly cost of a robot is $4, according to a recent Pew Research report, with other analysts estimating the cost of industrial robots approaching one dollar per hour. This levels the playing field between U.S. and Chinese competitors by practically eliminating the labor cost difference – labor cost being one of the primary reasons for outsourcing to China in the first place. Of course, automation also helps Chinese companies, but according to RI’s assessment, it helps developed countries more than developing countries. Automation reduces the labor hours required to produce goods and shifts the mix toward higher skilled workers. Compared to China, the wage gap is smaller at higher skill levels. Additionally, automation can actually be more costly in China because machinery is subject to their Value Added Tax. The other significant advantage of robotic assembly is that it eliminates human error, drastically improving product quality. So, overall, as industrial robots improve factory productivity, maximize flexibility & repeatability, and lower long-term costs, bringing manufacturing back to the USA begins to look attractive indeed. Decreasing costs and improving quality – isn’t that the ultimate business metric for positive change? According to a Boston Consulting Group survey, 80 percent of American consumers would be willing to pay more for U.S.-made goods. In fact, nearly a quarter of them were willing to pay a price premium of at least 10% across all categories of goods surveyed. And, 60 percent of respondents reported having done so in the past month. There are many hidden factors that have made the perceived savings from outsourced Chinese manufacturing to be much smaller than initially anticipated. Among the hidden costs are longer than expected delivery times. Five weeks after placing the order, from China to USA, is typical. This causes US manufacturers to lose deals or increase their local inventory size, which adds working capital costs and decreases flexibility. Other hidden factors include the use of unapproved suppliers or components, poor quality of finished products that often differ from samples, and lack of responsiveness to problems. The overall negative impacts to a company’s ability to be responsive and flexible in its market, deal with problems, and develop new products with protected innovations, are often not counted in during the early financial justifications for sending manufacturing to China. The concept of flexible manufacturing – the ability to make and deliver smaller quantities of special products to meet local customer needs – has also been gaining ground, and vendors are using it as their differentiator. Vendors relying on a complex global supply chain will find it difficult to compete with the local assembly plant that delivers high-quality made-in-home products directly to customers in the local market. Customer expectations have been changing also due to online retailers like Amazon. As of January 2019, there are already over 100 million Amazon Prime customers who have learned to expect products to be delivered next day, or even during the same day. This I-want-it-now attitude is beginning to also influence B2B enterprise markets. There is growing concern about the business ethic issues that show no signs of change in the Chinese market. Environmentally unsustainable business practices and horrific employee working conditions continue making the news. A study conducted by the Consumer Reports National Research Center indicates that more than 80 percent of U.S. respondents cited keeping U.S. manufacturing strong in the global economy as a very important reason for buying U.S.-made products. About 60 percent were concerned with the use of child labor offshore, or believed U.S.-made goods were of a higher quality. According to the AsiaInspection compliance organization, Chinese factories of all sizes still lag behind the rest of Asia in terms of environmental compliance despite efforts by the Chinese government and businesses in the last two years. In the first half of 2018, Chinese manufacturers received some of the lowest scores on waste management and pollution prevention, scoring on average 21% lower than their counterparts in the rest of Asia. Notably, small factories are doing worse than the rest: factories employing less than 100 workers accounted for more than two-thirds of major non-compliances in the first half of 2018, while comprising less than half of all facilities audited for environmental compliance. The most frequently discussed risk in outsourcing to China has been the potential of intellectual property (IP) theft. China’s IP theft costs the U.S. economy between $225 billion and $600 billion annually, according to the Commission on the Theft of American Intellectual Property. China’s 2017 National Intelligence Law requires Chinese companies to support, provide assistance, and cooperate with China’s government intelligence work. This has a direct impact to IP protection. How can any private innovation stay protected with a Chinese manufacturing partner, if Chinese government has the right to know all the secrets? The 10 billion-dollar U.S. market for LED lighting products is a great example of an industry in transition. Traditionally, over 80% of LED lighting products have been manufactured in China, with unwillingness of U.S. vendors to invest in made-in-USA products due to labor cost and low profitability. Now, with the latest robotic assembly line innovations, opportunities for bringing manufacturing back to the USA are emerging. 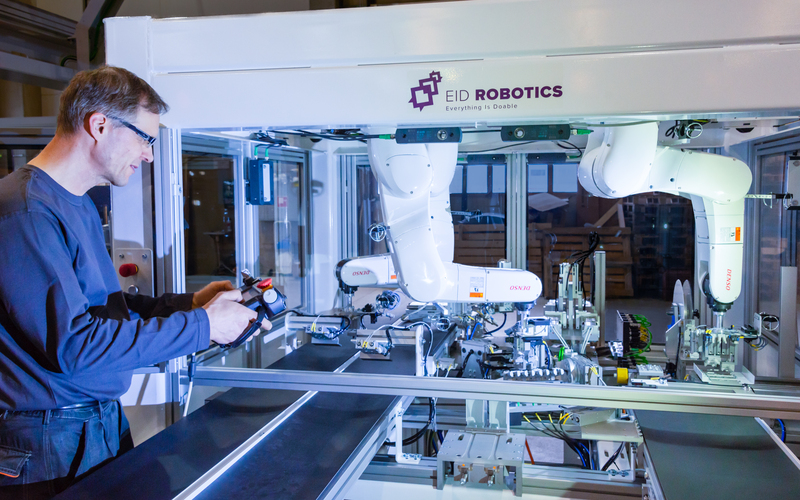 As an example of an industry-tailored robotic solution specifically developed for LED lighting products is EID Robotics Corp’s ANT Plant ®, a microfactory solution that can produce one million LED light tubes in one assembly line. It only takes 1,700 sqft space and one man to operate its cloud-controlled process. Based on early customers’ feedback on adopting ANT Plant, this mode of operation is indeed a success – similar operation in China required 100+ employees on the assembly line and produced in excess of 3% of product failures in the field, compared to under 1% field failures with the precise robotic assembly of ANT Plant. In summary, U.S. companies should stay focused on creating flexible, sustainable business models, where robotics and automation are strategic components in maximizing efficiency and staying competitive. The best way to bring manufacturing back home in the USA, and run profitable manufacturing businesses in global markets, may be to accept the reality of new ways of working at the factory floor. Assembly line robots have become our coworkers – not with the goal of replacing human workforce, but helping U.S. companies become more profitable and fast-track the delivery of high-quality products to customers, all with the shortest supply chain possible.